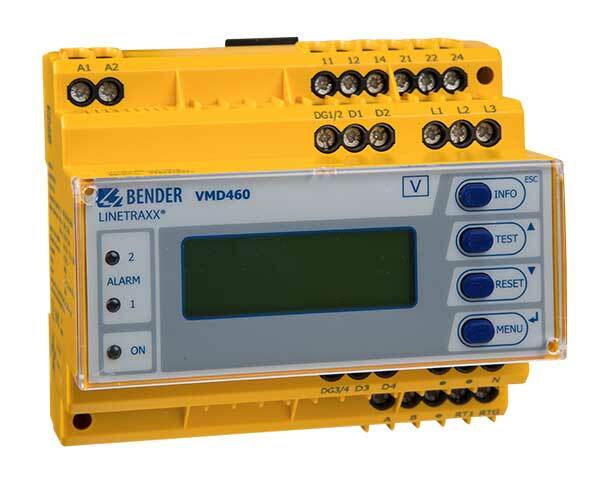 The VMD460 is an external network and system protection (NS protection) the purpose of which is to disconnect grid the power generation system from the grid by coupling switches in the event of inadmissible threshold values. If voltage and frequency measurements on the power generation system are outside the thresholds required in the standards, the relays of the VMD460 will switch. The VMD460 is multifunctionally adjustable. The currently measured values are continuously shown on the LC display. The measured values leading to the tripping of the relays are stored.